PLEASE POST on our forum = Just wanted to share this with everyone; our AIDog owner “BC Jackie” is now at Standing Rock Indian Rez. on the front lines protesting the pipe line coming through “Sacred Indian Land”. I want her to know that we are very proud of her & I ‘for one’ wish I could be there. Haven't been able to get the Forum to come up for several days. Not sure why. Edited by Sherab, 04 November 2016 - 06:12 AM. I'm all about preserving all of our land for any reason! We're with you all the way! Wounded Knee 1890, Wounded Knee 1973, now this....when will it stop? Hopefully this ecological mess will at the very least be re-routed from the sacred lands, then it would be really great if we could re-route every human heart to the fact that we are all one family and we all rely on the earth for our survival. Not Native American, but on the brink of tears as I write this. Not the first time something has happened and water contaminated - this is a real threat of the tribe's water. Lake Girl, I was just watching the youtube videos and thought "wounded knee" also. and about the Artifiacts the DAPL Company neglected to report - which should stop construction. and how unfortunate and horrible (and normal in today's society it is) that this didn't make main stream news around the country - except for there being arrests! Prayers for the Water Protectors and all who support them! Donations are needed for legal funds and fines (whether people are arrested allegedly legally or illegally) - THESE PEOPLE NEED OUR HELP HOWEVER WE CAN GIVE IT !!!!!!! I love this country and I can't stand by or for this ABUSE of the People!!!!!!!!!! I've donated to a few organizations now - if I can help with the resources I have, so be it. I send all the love and light to the people up there. Seeing the native New Zealand people sending a haka across the world - I hope they know how many people are standing with them. 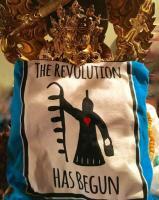 From this Mescalero Apache descendent, my spirit is with you. Edited by LakeGirl, 09 November 2016 - 07:26 AM. One of the owners of the DAPL was on the news this morning. He is happy and feels the pipeline will be finished soon. Says he's never met Trump, however, Trump is an investor in that company - conflict of interest, he needs to have a blind trust setup for his investments while he is President. Also, the person (or the company not sure - I didn't listen close enough after hearing Trump has an investment in that company) had donated $103,000 to Trump's campaign. Even after this was brought up to him he said he's confident the pipeline will be completed SOON! STRONG Prayers are needed to help the people of the land! Lots of news out there. Sure looks like they won. https://www.rt.com/u...-lake-rerouted/ A very merry Christmas indeed. Summary of key points: 1) The Obama admin did not insure a reroute or a stoppage, it threw some red tape at the situation where there is a possibility of success down the road. 2) An Environmental impact study will be done to evaluate this and several other routes, including the current route. There is a public comment process that can be used to help. Keep your eye open for requests to comment as members of the public. 3) Energy Transfer has hinted they might go ahead and take the fines and try to finish construction anyway because they can get $ from a contract that expires Jan 1 if the pipeline is "substantially complete". 4) Trump is unequivocally pro energy development. 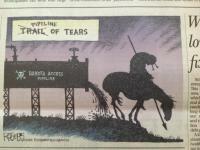 Dakota Pipeline is the "work around" to Keystone under Obama. I haven't seen any analysis of Dakota vs Keystone - but I understand they are from the same parent company TransCanada. Trump holds small investment in them and other energy companies and banks. I think his soft spots are - build world class - make them build something that doesn't leak for once and people - do right by Native Americans and don't build stupid - protect sensitive areas. That's not "no pipeline" but as I look around my own home I'm not ready for no pipeline and I suspect I'm like most people. Much homework is to be done to get to that place and that's on us. 5) The press has said very little about this up until the election. The stories I've seen gloss over the water cannons, grenades and rubber bullets or blame the protestors. The optics are epic terrible and yet the stories are only now coming out a little more frequently and sympathetically than before the election. I expect this will change "biggly" after Jan 21 and the protestors will get more and better coverage. Do I think it's dishonest of the press - you bet. Will I be glad of this powerful ally - you bet. That's my 2017 prediction. Enjoy the win and hang on to your hats. Edited by Sherab, 05 December 2016 - 08:23 AM. I think the retired military Vets around the country that have gone there in thousands to be human shields for the water protectors - is a great stand and helped. Also many in this country and around the world are finding out about this, that helps. Then there is the fact that Americans (in general) are realizing it's just the Lakota's drinking water but will affect millions of people if/when the pipeline breaks under the Missouri River. Unbelievable how that makes a difference. I'm not going to argue the semantics just glad for all the support getting behind the Water Protectors. A battle has been won, and I keep praying that the Water Protectors WIN THIS WAR! We've had a couple of gas pipelines leak in the southeast in the last few months. I heard a reporter say something like this morning: "Plumbers are in business because all pipes eventually leak." Today, the Obama Administration announced that it will not grant the final easement for the Dakota Access pipeline to cross the Missouri River. They did not DENY the easement, they SUSPENDED a decision on the easement until an Environmental Impact Statement is conducted on ALTERNATIVE river crossings. 1) Will DAPL investors continue to flee and leave the pipeline financially stranded? 2) Will oil suppliers see the writing on the wall and drop their contracts with DAPL next month? 3) Will President-elect Trump take any action of the pipeline should the first two options not happen? Good questions -- But that doesn't stop the victory songs tonight! We celebrate this tremendous win, give our allies hugs, and remain vigilant for the fight to come! Our community remains cautiously optimistic. And we take this moment to celebrate. The People need celebration and hope, especially our families and friends in the camps. Let's keep our support strong for them as they will continue to stay in camp, vigilant and watchful. Our gratitude for all your support climbs to the sky. This community has proven to be rich with endless compassion. For many of our families in R.E.D. who have suffered the effects of colonization and genocide, this time of awakening is profound and is healing Nations as we speak.